Oh I see, I am sorry, I did not know that tacrolimus was found to improve melanin concentration. If your hypopigmentation is more or less on just several spots, buy a 1 mm dermastamp. Stamp the white patch (every week) and also a little over the edges of the white patch to facilitate the migration of melanocytes from the surrounding normal skin into the white patch. Stamp normally pigmented skin several times to try to "harvest" some melanocytes and then stamp the hypopigmentation. Melanocytes are at the bottom of the epidermis, whose thickness is 0.1 - 0.3 mm. (Try it with and without occlusive dressing). Apply your Protopic cream right after stamping and continue applying it every day. When the skin is healed from microneedling, expose your spots to your NB-UVB lamp. Basically you have to improvise a little and try various approaches. Unfortunately, there is no one single approach that always works for everybody. I got permission from this customer to publish her email, as long as we protected her identity. Unfortunately she did not manage to document her progress with photos. We remind our customers that when you document good progress and post it here (if you want anonymously and we can help you with covering the eyes - just send us the pictures and we'll attach them to the posting), that we will reward you with products of your choice! I just had to write to tell you about my results. I am 42 years old and have had acne my entire life. I of course have lots of scarring from that. Over the last couple of years I've noticed that the scarring has gotten way worse or way more apparent and I suppose that is because I am losing some of the plumpness in my skin from aging. I started to consider some kind of surgical intervention b/c it looked so bad but I just can't afford that. A friend told me about microneedling and honestly I didn't have much hope but thought I would give it a try. I have had AMAZING results!!! They are better than what I could have hoped for in a surgical intervention. My scarring has filled in by at least 50% - I think more. I used to have literally huge dents in the side of my head that I could run my fingers over and feel the big dents. They are pretty much gone now. My cheeks have filled in. I could not be happier!!! I tried to take b efore pics but they never turned out right. I needed better lighting and a friend probably to take the pics but anyway. I am just so happy and wanted to thank you for your products and writing out how to use them and being so trustworthy. I will keep working my products. THank you! Yes, we are replacing the lotion with a cream version but the percentage of Tretinoin in it will stay the same. We got a few complaints that the lotion is too runny (watery) so that's why. Nevertheless, you can squeeze some of the Tretinoin cream into a jar and add a little distilled water to it if you prefer to have it more "light" or you can mix in for example a little of another cream. If you do not mind, then leave it overnight. Dermarolling / Microneedling / Re: Can dermarolling cause fine lines? Yes, you should continue with Infadolan and hopefully the skin texture will gradually improve. I do not understand why it happened on your forehead but not on those other areas where you also used a dermastamp. Do not excessively sunbathe but do not completely shelter yourself from the sun. Every now and then, expose yourself for about 15 minutes to the sun with enough of exposed skin to get sufficient vit. D.
If you have dark skin, you need to stay about three times longer in the sun, as dark skin contains more melanin pigment which is a natural UV filter. Thirty minutes of full-body sun exposure causes the synthesis of 10,000 to 20,000 IU vitamin D. Taking such amounts in supplements would be toxic - for a reason not fully understood. The levels are not toxic if trigger by sun exposure. Oral supplementation of vit. D is a very poor substitute for sun exposure. Vit. D, a hormone, really is intended to be created in our skin, not absorbed by our digestive system. Using a dermastamp can also improve scars that are permanent and will not improve by themselves. You should keep the skin moisturized after microneedling with a product of which you know does not break you out. This is individual and what works for one does not work for the other so I tend not to recommend anything specific for acne prone individuals. Not more than 5% salicylic acid. The products for regular use on acne usually contain 2%. We sometimes get emails stating that laser- or IPL treatment left people with hyperpigmentation, hypopigmentation or even scars. It doesn’t happen very often but it happens. Intense Pulse Light (IPL) or lasers work on the same principle. They heat up the skin. The tissue absorbs light from the laser and that heats it up. Everything in the skin absorbs laser light but some parts (for example dark colored parts) absorb it quicker, especially if specific wavelengths of light are used. Thus, you can target hemoglobin in the blood and seal spider veins through heat. In laser epilation, you target the melanin pigment in the hairs and the heat will temporarily weaken the hair bulb. You can target tattoo pigment and the heat disperses it. You can stimulate collagen production by slightly heating up the water molecules in the skin or use more energy and actually evaporate a layer of skin or just fractions of skin (Fraxel). You can even cut steel with sufficiently powerful laser light and that works on the same principle. However, because everything in the skin absorbs laser light to a certain degree, this technique is prone to "collateral damage". Not only hairs but the skin itself contains melanin. It is a pigment that makes up the color of the skin. It is our natural UV filter. The darker the skin the more melanin it contains and the more prone it is to collateral damage. In some unfortunate cases, the heat destroys for example melanocytes (pigment producing cells) and you end up with hypopigmented spots. I am not sure it was a good idea to undergo laser treatment just a few months after using Accutane because Accutane potentially makes skin more prone to scarring and unpredictable healing and it is generally recommended to wait at least six months. I also do not quite understand why you used Protopic because it is an immune-suppressant. It can effectively suppress (chronic) inflammation (present in certain eczemas and skin rashes) because inflammation is an immune reaction. It can reduce redness (hyperpigmentation) if the redness is caused by inflammation but it cannot help hypopigmentation. I will post another reply later concerning suggested treatment. Dermarolling / Microneedling / Re: one large dermastamp per session (whole face)? You do not need more than one large dermastamp to do your face but replace it after about six full face stampings. If the needles seem blunt, replace it even sooner. It means you will need about three large stamps a year when stamping the entire face every three to four weeks. We don't control what's on that box - it's apparently based on a general, average-size treatment area typical for its use (usually the stomach or thighs for a large dermastamp). The processes triggered by dermarolling will not have been completed in three weeks so this may still improve by itself. All reactions of your skin that you describe are normal. The skin may start peeling within a few days or much later. This is individual. Redness, tenderness and sensitivity is completely normal after dermaneedling. Scars caused by burns tend to be shiny. The entire top layer of the skin is gone, in burns. The popping sound may and may not be present. Both are normal and OK.
You should wait several days before exposing the scar to the sun. "Initially, Tretinoin makes skin dry. Wrinkles and lines are more visible on dry skin and that is why it may seem in some cases that Tretinoin worsened wrinkles but it did not. Long term, Tretinoin improves wrinkles." Have you been by chance using anything that dries the skin? Dermarolling also dries the skin but this effect usually lasts only a few days after dermarolling when the skin is being renewed and the skin is also rough and tender. Vit. C rarely also may cause dryness in some individuals. The processes in the skin that were started by dermarolling have not yet been completed in three weeks so the skin will still be changing. Your acne is mild enough to be able to use dermarolling. If your scars are relatively recent, they may still improve by themselves a little. Did you have scars before the recent strike of cystic acne? 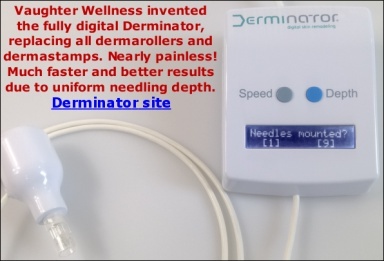 Buying a 1.5 mm dermastamp with 35 needles is definitely a good idea in your case but do a test patch first to see how your skin and how your scars react. I do not think your cheeks lack elasticity. Do not buy our Infadolan because your skin is prone to breakouts. Many acne sufferers claim benzoyl peroxide helps. Concerning acid peels, I think the best is to use salicylic acid. Not in high percentages that are used for peeling but in relatively low percentages, used regularly to hopefully keep acne under control. Salicylic acid (Beta Hydroxy Acid) is very useful in acne prone skin because salicylic acid is oil soluble - it has ability to clean pores from the inside. It is necessary to use it long-term. You do not seem to have blackheads though. Tretinoin cream also unclogs pores but you are already using it. You should give the red scar some time off. Flattening a raised scar will make it red but if you stop the treatment, the redness will eventually diminish. When you re-start the treatment, the redness will unfortunately come back. Or reduce the frequency of stamping but I do not think that will be enough for the redness to go away. Try it. Tretinoin will not help this kind of redness. To further flatten the scar, you can try applying the wart remover every day or every second day (without needling). Apply just a little. Be really careful on the delicate skin of the neck so that you only apply it to the scar and not to the scar-less skin because the wart remover is quite strong acid peel. The arm skin is not so delicate. In a few days we will sell a 0.025% Tretinoin cream. That percentage is still very effective and not so irritating. For use on the face, this percentage is ideal. The more is not the better concerning Tretinoin, especially on facial skin.